When Bette Madill's husband Henry, who had Alzheimer's, was in hospital with pneumonia, "the telephone in his room rang about 2 a.m. one night," Madill recalls. "It was one of the staff at Alexis Lodge wanting to speak to Henry." For Mary Vari, it was the smell that hit her first. In the long search for a caring place to look after her mother, whohas Alzheimer's, Vari had become used to the unpleasant odour of disinfectant or, worse, stale urine. Then she came to the door of an unassuming house on Ellesmere Ave. and suddenly everything was different. "There was a warm, homey smell, like soup simmering on the stove,"she says. "I think there was a cake in the oven, too. I'll never forget that. I knew I'd found something special." 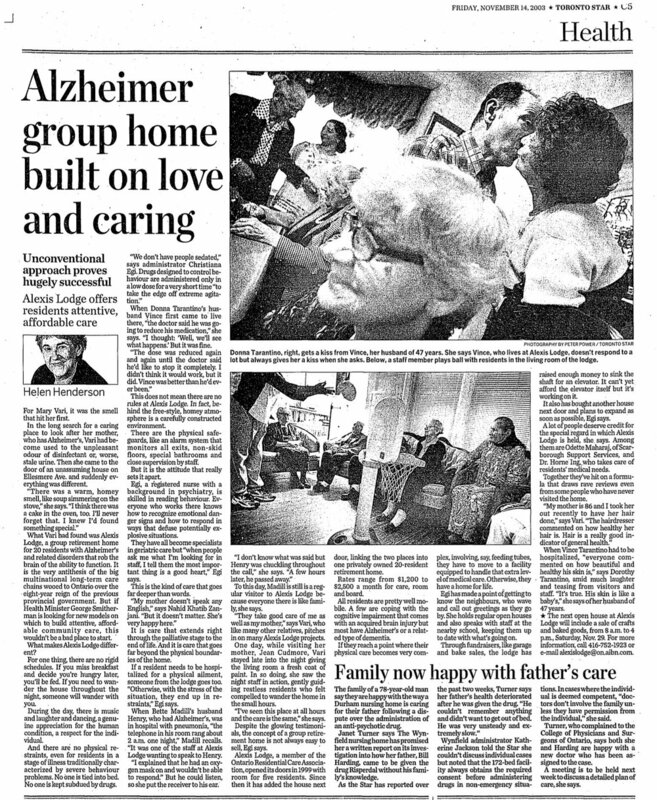 What Vari had found was Alexis Lodge, a group retirement home for20 residents with Alzheimer's and related disorders that rob the brain of the ability to function. It is the very antithesis of the big multinational long-term care chains wooed to Ontario over the eight-year reign of the previous provincial government. But if Health Minister George Smitherman is looking for new models on which to build attentive, affordable community care, this wouldn't be bad place to start. What makes Alexis Lodge different? For one thing, there are no rigid schedules. If you miss breakfast and decide you're hungry later, you'll be fed. If you need to wander the house throughout the night, someone will wander with you. During the day, there is music and laughter and dancing, a genuine appreciation for the human condition, a respect for the individual. And there are no physical restraints, even for residents in a stage of illness traditionally characterized by severe behaviour problems. No one is tied into bed. No one is kept subdued by drugs. "We don't have people sedated," says administrator Christiana Egi. Drugs designed to control behaviour are administered only in a low dose for a very short time "to take the edge off extreme agitation." When Donna Tarantino's husband Vince first came to live there, "the doctor said he was going to reduce his medication," she says. "I thought 'Well, we'll see what happens.' But it was fine. "The dose was reduced again and again until the doctor said he'd like to stop it completely. I didn't think it would work, but it did. Vince was better than he'd ever been." This does not mean there are no rules at Alexis Lodge. In fact,behind the free-style, homey atmosphere is a carefully constructed environment. There are the physical safeguards, like an alarm system that monitors all exits, non-skid floors, special bathrooms and close supervision by staff. But it is the attitude that really sets it apart. Egi, a registered nurse with a background in psychiatry, is skilled in reading behaviour. Everyone who works there knows how to recognize emotional danger signs and how to respond in ways that defuse potentially explosive situations. They have all become specialists in geriatric care but "when people ask me what I'm looking for in staff, I tell them the most important thing is a good heart," Egi says. This is the kind of care that goes far deeper than words. "My mother doesn't speak any English," says Nahid Khatib Zanjani. "But it doesn't matter. She's very happy here." It is care that extends right through the palliative stage to the end of life. And it is care that goes far beyond the physical boundaries of the home. If a resident needs to be hospitalized for a physical ailment,someone from the lodge goes too. "Otherwise, with the stress of the situation, they end up in restraints," Egi says. When Bette Madill's husband Henry, who had Alzheimer's, was in hospital with pneumonia, "the telephone in his room rang about 2a.m. one night," Madill recalls. "It was one of the staff at Alexis Lodge wanting to speak to Henry. "I explained that he had an oxygen mask on and wouldn't be able to respond." But he could listen, so she put the receiver to his ear. "I don't know what was said but Henry was chuckling throughout the call," she says. "A few hours later, he passed away." To this day, Madill is still is a regular visitor to Alexis Lodge because everyone there is like family, she says. "They take good care of me as well as my mother," says Vari, who like many other relatives, pitches in on many Alexis Lodge projects. One day, while visiting her mother, Jean Cudmore, Vari stayed late into the night giving the living room a fresh coat of paint. In so doing, she saw the night staff in action, gently guiding restless residents who felt compelled to wander the home in the small hours. "I've seen this place at all hours and the care is the same," she says. Despite the glowing testimonials, the concept of a group retirement home is not always easy to sell, Egi says. Alexis Lodge, a member of the Ontario Residential Care Association,opened its doors in 1999 with room for five residents. Since then it has added the house next door, linking the two places into one privately owned 20-resident retirement home. Rates range from $1,200 to $2,500 a month for care, room and board. All residents are pretty well mobile. A few are coping with the cognitive impairment that comes with an acquired brain injury utmost have Alzheimer's or a related type of dementia. If they reach a point where their physical care becomes very complex, involving, say, feeding tubes, they have to move to facility equipped to handle that extra level of medical care. Otherwise, they have a home for life. Egi has made a point of getting to know the neighbours, who wave and call out greetings as they go by. She holds regular open houses and also speaks with staff at the nearby school, keeping them up to date with what's going on. Through fundraisers, like garage and bake sales, the lodge has raised enough money to sink the shaft for an elevator. It can't yet afford the elevator itself but it's working on it. It also has bought another house next door and plans to expand as soon as possible, Egi says. A lot of people deserve credit for the special regard in which Alexis Lodge is held, she says. Among them are Odette Maharaj, of Scarborough Support Services, and Dr. Horne Ing, who takes care of residents' medical needs. Together they've hit on a formula that draws rave reviews even from some people who have never visited the home. "My mother is 86 and I took her out recently to have her hair done," says Vari. "The hairdresser commented on how healthy her hair is. Hair is a really good indicator of general health." When Vince Tarantino had to be hospitalized, "everyone commented on how beautiful and healthy his skin is," says Dorothy Tarantino, amid much laughter and teasing from visitors and staff. "It's true. His skin is like a baby's," she says of her husband of 47 years. The next open house at Alexis Lodge will include a sale of craftsand baked goods, from 8 a.m. to 4 p.m., Saturday, Nov. 29. For moreinformation, call 416-752-1923 or e-mail admin@alexislodge.com. photography by Peter Power / toronto star Donna Tarantino,right, gets a kiss from Vince, her husband of 47 years. She says Vince, who lives at Alexis Lodge, doesn't respond to a lot but always gives her a kiss when she asks. Below, a staff member plays ball with residents in the living room of the lodge.